The Portland Branch of the Victoria Police Blue Ribbon Foundation worked over several years to install an Emergency Helipad at Portland Hospital. The original proposal was to install the helipad on the Ploughed Field directly opposite the hospital. Extensive complications with this site required a revised plan and, after consultation with hospital management and engineers, we were able to free up existing hospital land directly adjacent to the emergency department. For our Portland Branch and the community of Portland this project was a labour of love. Almost all of the project planning, materials and labour required to build the helipad was donated by local businesses and qualified trades people. A significant portion of the $100,000 financial donation from the Blue Ribbon Foundation was also raised in the local community. This truly is an example of a community staying very focused on achieving their goal of providing much-needed hospital infrastructure in one of the most remote places in our State. This community now has a permanent capacity to provide emergency evacuations of critical patients to larger hospitals and specialised treatment centres in Warrnambool and Melbourne. It overcomes existing restrictions on helicopter operations only during daylight hours. High-strength construction to accommodate larger machines, fully fuelled. Capacity to operate 24/7, subject to weather conditions. Traffic signals to control vehicle and pedestrian traffic during aircraft operations. 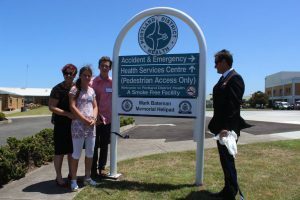 The Helipad was dedicated as a Police Memorial in honour of Senior Constable Mark Bateman (30810) who died in the line of duty from injuries he received in a motor vehicle crash at Northcote in May, 2000. His two children, Jack & Daisy, made hand impressions into a foundation stone that is now part of the helipad structure. The Victoria Police Blue Ribbon Foundation especially acknowledges the incredible commitment by Mr Bob Carr, who acted as Project Manager and also the leadership and persistence of retired Highway Patrol Senior Sergeant, Bob Meek.